Have you just started out your career in the cultural sector? Or are you thinking that working in the cultural sector might be for you? Come along to our brand new GLAM event, New GLAM-er! You will hear from four rising stars who work in the cultural sector and learn about their work and how they got to where they are today. You will also get a chance to talk to these New GLAM-ers and raise the issues and ideas that you think we need to tackle in the sector as early career professionals. It will also be an opportunity to network and socialise over drinks and nibbles with a bunch of cool people in the cultural sector. 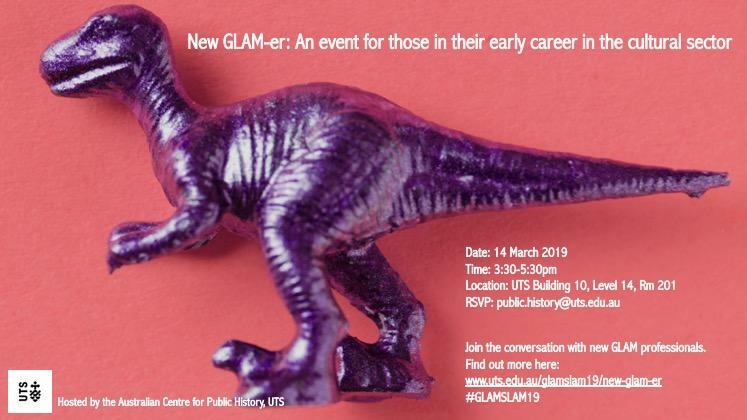 New GLAM-er is a Fringe Event for GLAMSLAM 2019.